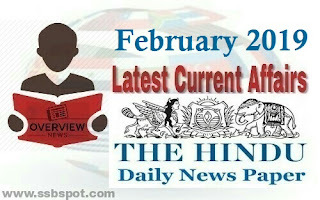 Latest Current Affairs 2019 for competitive exams UPSC, AFCAT, TNPSC, IAS, RRB and Latest Affairs 2019 for banking exams IBPS PO Clerk, SBI, RBI and more. 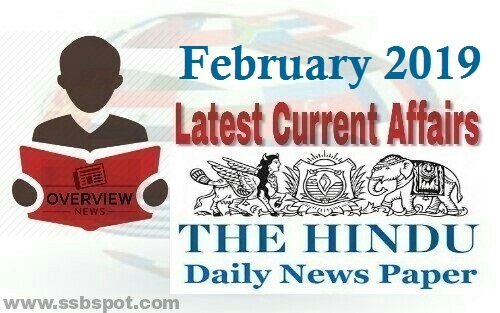 Read daily affairs, this beneficial Affairs 2018 resource yields the facts about the events of International affairs, National, Sports, Business, Banking Current Affairs of 2019 and more which are betterment for the Government & Private Job aspirants. * Prime Minister Narendra Modi dedicated a new National War Memorial, situated in the India Gate complex in New Delhi, to the nation. The National War Memorial, spread over 40 acres in the India Gate complex behind the canopy, is dedicated to soldiers killed during the Indo-China War in 1962, Indo-Pak Wars in 1947, 1965 and 1971, Indian Peace Keeping Force Operations in Sri Lanka and in the Kargil Conflict in 1999, and also those in the UN peacekeeping missions. * Union Home Minister Rajnath Singh inaugurated a new park which houses the replicas of seven wonders of the world at South Delhi. The park, which is called the 'Waste to Wonder Park', was built by the South Delhi Municipal Corporation (SDMC). * Union Minister for Science & Technology, Earth Sciences, Environment, Forest and Climate Change, Dr. Harsh Vardhan, inaugurated the North Karnataka Agromet Forecasting and Research Centre (NKAFC), India’s first agromet forecast centre, at University of Agricultural Sciences (UAS) in Dharwad, Karnataka. * Following the attack in Jammu & Kashmir's Pulwama that left 44 CRPF personnel dead, India has withdrawn the MFN (Most Favoured Nation) status that it had granted to Pakistan. * Indian Government has signed a deal with the US under Fast Track Procurement (FTP) to avail the Indian Army with 72,400 new ‘Sig Sauer Assault Rifles’ which will overhaul the army’s inventory of frontline rifles. * The last session of 16th Lok Sabha came to an end on 13th of February 2019. Giving the details for the tenure of 16th Lok Sabha, Parliamentary Affairs Minister Narendra Singh Tomar informed that there were a total number of 331 sittings for Lok Sabha. 205 bills were passed and the productivity was 85%. For Rajya Sabha, 154 bills were passed and the productivity was 68%. * PM Modi launched a dedicated 24x7 Satellite channel, ‘DD Arunprabha’ for Arunachal Pradesh during his visit to Arunachal Pradesh, Assam, and Tripura. * PM Modi dedicated to the nation the 1.33 million metric ton capacity Visakhapatnam Strategic Petroleum Reserve facility at Guntur in Andhra Pradesh. He also laid the foundation stone for setting up of a new terminal of Bharat Petroleum Corporation Limited (BPCL) at Krishnapatnam. * India and Bangladesh signed an MOU for training 1800 Bangladesh Civil Servants at the National Centre for Good Governance (NCGG) an institute under the Department of Administrative Reforms and Public Grievances (DAR&PG), Ministry of Personnel, Public Grievances & Pensions, Govt. of India, over the next 6 years. * India and Germany joined hands for cooperation on Water and Waste Management. * External Affairs Minister Sushma Swaraj and Road Transport and Highways Minister Nitin Gadkari flagged off Suraksha Yatra – a motor car rally from Rajghat in New Delhi to commemorate the 150th Birth Anniversary of Mahatma Gandhi. * PM Modi inaugurated and laid the foundation stone for various development projects, worth nearly 12,000 crore rupees, at Leh. He laid the foundation stone for a 480 crore rupee Terminal Building at Leh Airport. Mr Modi inaugurated the 9-megawatt Dah hydroelectric project. He also dedicated to the nation the 220 KiloVolt Srinagar-Alusteng-Drass-Kargil-Leh transmission system & also launched the University of Ladakh, the first-ever in the state's region. * The Department of Industrial Policy and Promotion (DIPP) has been renamed as the Department for Promotion of Industry and Internal Trade with a mandate to deal with matters related to start-ups, facilitating ease of doing business among others. * ‘KALIA Chhatra Bruti’ scholarship for the children of farmers benefited under the KALIA scheme was launched by the Odisha Chief Minister Naveen Patnaik in Bhubaneshwar, Odisha. * In Uttar Pradesh, Chief Minister Yogi Adityanath launched Scheme for Adolescent girls (SAG). The scheme focuses on girls aged between 11 to 14 years who have left studies and will take steps for proper nutrition and special care for them. * Union Minister of State for Food Processing Industries, Sadhvi Niranjan Jyoti, inaugurated Tripura’s first mega food park named Sikaria Mega Food Park Pvt Ltd at Village Tulakona in Agartala. * Bihar has become the first state to deploy specially-trained dogs to check smuggling of liquor which continues to take place inspite of the total ban imposed in the state for the last 3 years. * Tamil Nadu became the first state in the country to get a second Coast Guard district headquarters - Thoothukudi. The first district headquarters is Chennai. 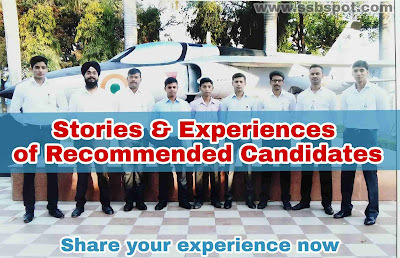 * Madhya Pradesh Chief Minister Kamal Nath launched the State Government’s flagship scheme ‘Mukhyamantri Yuva Swabhiman Yojana’ that guarantees 100 days of employment every year to urban youth from economically weaker sections. Under the scheme, Rs 4,000 stipend per month during 100 days period, would be given to the youth and they will also be given skill development training in order to become independent. (Only those youths, whose family’s annual income is less than Rs 2 lakh and who are in the age group of 21-30 years, are eligible for the scheme). * Assam Chief Minister Sarbananda Sonowal launched the PRANAM Commission, which is a panel set up to look after the issues concerning a Bill brought in for the protection of parents of state government employees. The Parents Responsibility and Norms for Accountability and Monitoring (PRANAM) Bill, stated to be the first-of-its-kind bill in the country, aims to protect elderly parents of government employees in their times of need. * West Bengal Education Minister Partha Chatterjee inaugurated a web portal, 'Banglar Shiksha', which is set to provide real-time data on state-run and aided schools. The portal, banglarshiksha.gov.in, will be up and running in two months' time, the minister stated. A statement issued by the school education department stated that the portal will store real-time data of 1.5 crore students, 5 lakh teachers and 1 lakh schools. * Union Minister of Textiles, Smriti Zubin Irani, launched four projects in North East for the development of silk sector through video conference in New Delhi. She inaugurated Muga silk seed production centre in Tura, Meghalaya, silk printing and processing unit in Agartala, Tripura, Eri spun silk mill in Sangaipat, Imphal and development of sericulture in Mamit, Mizoram. * PM Modi unveiled development projects worth Rs. 3350 crores for Varanasi, Uttar Pradesh. These projects pertain to various sectors of Health, Sanitation, Smart City, Connectivity, Power, Housing and others. He released commemorative postage stamp on completion of 100 Years of IIT BHU. * The Legislative Assembly of Rajasthan passed the Rajasthan Panchayati Raj (Amendment) Bill, 2019 and the Rajasthan Municipality (Amendment) Bill, 2019 to end the minimum education criterion for panchayat and civic polls candidates. * Bihar Chief Minister, Nitish Kumar announced a Universal Old Age Pension scheme, named Mukhya Mantri Vriddha Pension Yojana (MMVPY), irrespective for all caste, community, religion, except for those who are retired from government organizations. The scheme facilitates the amount of Rs. 400 monthly pension for all in the state above the age of 60 who are not getting a pension from the government. * Union Minister of Food Processing Industries Harsimrat Kaur Badal commissioned Godavari Mega Aqua Food Park at Tundurru Village in Bhimavaram Mandal, West Godavari District & Andhra Pradesh through video conferencing. It will be the first Mega Aqua Food Park operationalised exclusively for fish and marine products processing in the state of Andhra Pradesh. * Meghalaya Cabinet has decided to rename the Dikkibandi stadium in Tura town after former Lok Sabha Speaker Purno A Sangma. * In Bihar, Governor Lalji Tandon and Union Agriculture Minister Radha Mohan Singh jointly inaugurated the three-day Krishi Kumbh in Motihari. Over fifteen thousand farmers from different states and about two hundred agricultural scientists are participating in the Kumbh. * Union Minister for Food Processing Industries Harsimrat Kaur Badal laid the foundation stone of a Mega Food Park at Chhata-Barsana road in Mathura. * The State Government of Jammu and Kashmir issued a notification of creation of Ladakh as 3rd Division in the state. * The Union Road Transport Minister Nitin Gadkari laid the foundation stone of three major highway projects with an investment worth Rs 2,345 crores in Odisha. The three highway projects are expected to considerably improve connectivity of mineral-rich Angul and Dhenkanal districts with the rest of Odisha. * Punjab Chief Minister Captain Amarinder Singh announced a high-powered 5-member committee to prepare a comprehensive action plan to boost the dairy sector with the aim of supplementing the income of farmers in a result-oriented manner. * Kerala become the first State to set up a Price Monitoring and Research Unit (PMRU) to track violation of prices of essential drugs and medical devices under the Drugs Price Control Order (DPCO). * Punjab government approved a rural development scheme worth Rs 384.40 crore to supplement the ongoing works to build village infrastructure and provide essential amenities. It is named as 'Smart Village Campaign'. * India-ASEAN trade and investment relations have been growing steadily, with ASEAN being the second largest trading partner of India, after China, with a total bilateral merchandise trade of USD 81.33 billion. * A month-long ‘Festival of India’ held in Kathmandu, Nepal to familiarise the new generation of the country about the similarities between the two countries. * Chinese news agency Xinhua unveiled the world’s first female AI news anchor Xin Xiaomeng. She has been developed in collaboration with Sogou Inc, a search engine company. * Sudanese President Omar al-Bashir has declared a year-long state of emergency, dissolving his cabinet and local governments throughout the country. * Zimbabwe started to trade its new currency, the RTGS dollar, two days after the central bank announced measures to try and resolve a chronic monetary crisis. * US President Donald Trump signed Space Policy Directive-4 (SPD-4), ordering the Pentagon to establish the Space Force as the 6th branch of the United States military, to go along with the Army, Navy, Air Force, Marines, and Coast Guard, in order to secure and extend American dominance of the space domain. * Thailand and the United States hosted the annual Cobra Gold military exercise, the biggest activity of its type in the Asia-Pacific region with 29 nations taking part as participants or observers. * Muhammadu Buhari was re-elected Nigeria's President, results showed, after a delayed poll that angered voters and led to claims of rigging and collusion. * Saudi Arabia became the 73rd nation to sign the International Solar Alliance. ISA was unveiled by PM Modi and former French President Francois Hollande in 2015. * Iran’s President Hassan Rouhani unveiled the first Iranian made semi-heavy submarine named 'Fateh' ('Conqueror' in Persian), capable of being fitted with missiles, as per the reporting on Iran’s state TV. * The country, formerly known as the Republic of Macedonia officially changed its name to the Republic of North Macedonia, on paper ending a decades-long dispute that should pave the way for NATO membership. * Asian Development Bank (ADB) raised 5.2204 billion Philippine pesos ($100 million) from a new issue of local currency bonds in the international market. Currency-linked bonds are denominated in the local currency but settled in US dollars. * Abu Dhabi decided to include Hindi as the third official language used in its courts, alongside Arabic and English, as part of a move designed to improve access to justice. * US Commerce Secretary Wilbur Ross announced the names of the American private sector members of the US-India CEO Forum among who are MasterCard CEO Ajay Banga and Qualcomm CEO Steve Mollenkopf. The first meeting of the forum will be held in New Delhi. * Macedonia signed an accord to join NATO to become the 30th member of the US-led alliance. * The United Nations announced 2019 as the International Year of the Periodic Table of the Chemical Elements to highlight its first publication in 1869. * Indian Air Force conducted mega exercise ‘Vayu Shakti’ in Pokhran, Rajasthan. The exercise was carried out day and night where the IAF showcased firepower capability of indigenously developed platforms and efficacy of missiles. * Flight Lieutenant Hina Jaiswal from Chandigarh, became the First Indian Woman Flight Engineer of the Indian Air Force (IAF). * Indian Army showcased its artillery firepower by using ultralight Howitzers and indigenous Swathi weapon-locating radar at the annual “Exercise Topchi”. The exercise was held at Deolali Camp near Nashik. * Joint Humanitarian Assistance and Disaster Relief Exercise `Exercise Rahat´ concluded in Jaipur, Rajasthan. It was demonstrated in Jaipur, Kota, and Alwar in Rajasthan. * INS Trikand, the frontline warship of the Indian Navy, participated in a multi-national training exercise ‘CUTCLASS EXPRESS 2019’. The annual Exercise Cutlass Express is sponsored by U.S. Africa Command (USAFRICOM) and conducted by Naval Forces Africa (NAVAF). It was held in the vicinity of Djibouti, Mozambique and Seychelles. * The 5-day multinational maritime exercise ‘AMAN-19’ in which 46 nations participated from all over the world was formally commenced at Pakistan Navy Dockyard, with a colorful flag hoisting ceremony. * Defence Acquisitions Council, DAC chaired by Defence Minister Nirmala Sitharaman approved indigenous construction of six submarines worth 40 thousand crore rupees. It also approved the acquisition of about five thousand MILAN Anti-Tank Guided Missiles for the Army. * As part of the ongoing India Bangladesh defence cooperation, a joint military exercise Sampriti-2019 will be conducted at Tangail, Bangladesh from 02 March to 15 March 2019. * In a major boost for the Navy's firepower, the Defence Ministry has approved the acquisition of more than 100 heavyweight torpedoes which will be equipped on the force's six Scorpene-class submarines being built at Mazagon Dockyards in Mumbai. * Cyber Prevention Awareness and Detection (CyPAD) Centre and the National Cyber Forensic Lab (NCFL) were inaugurated by Union Home Minister Rajnath Singh and LG Anil Baijal in Dwarka, New Delhi. To spread awareness among school students and teachers, the Ministry of Home Affairs (MHA) started a popular Twitter handle @CyberDost. * Bandicoot, a drainage-cleaning robot introduced for the first time in India at the Kumbakonam city corporation as part of efforts to rid of manual scavenging at the cost of Rs 18 lakh in Chennai, Tamil Nadu. It is a semi-automatic robot can enter manholes for cleaning sewage lines with its robotic arm. * AntBot is the first walking robot to have navigational capabilities without GPS or mapping. It has been designed by Centre for Scientific Research (CNRS) and Aix-Marseille University researchers at ISM. * Israel is to launch its first moon mission, sending an unmanned spacecraft to collect data to be shared with NASA. According to a report, the 585-kilogram Beresheet (Genesis) spacecraft is to lift off atop a Falcon 9 rocket from Cape Canaveral, Florida. * NASA announced a new space telescope mission dedicated to understanding the origins of life and the universe. It's called the Spectro-Photometer for the History of the Universe, Epoch of Reionization and Ices Explorer or SPHEREx, for short. The space agency is aiming for a 2023 launch. * NASA announced that its Opportunity Rover mission is complete after the rover failed to respond despite repeated trials since August 2018. The space agency inferred that a planet-encircling dust storm cut off communications with Opportunity on June 10, 2018, disabling its solar panels from storing power. * ISRO unveiled its Human Space Flight Centre (HSFC) at ISRO Headquarter campus in Bengaluru, Karnataka for its maiden manned space mission 'Gaganyaan'. It was inaugurated by K Kasturirangan, former ISRO Chairman. * Railway Minister Piyush Goyal launched Rail Drishti Dashboard in New Delhi. The dashboard has been launched to keep people informed about the work going on in the Railways across the country. * A small brown rat of bramble cay melomys species lived on a tiny island off northern Australia becomes the world’s first mammal to have become extinct due to “human-induced climate change”. * Wallace’s giant bee (Wallace Bee), the largest bee known on the Earth which was considered to be extinct since 1981 was re-spotted in an Indonesian forest. * Union Textiles Minister Smriti Irani inaugurated the ‘Titanwala Museum’ that showcases the hand block printing of the Chhipa community in Bagru. Bagru printing is one of the traditional techniques of printing with natural color followed by the chippas of Rajasthan. * Under ‘Make in India’ initiative, Indian Railways created history by converting a diesel locomotive into electric locomotive for the first time in the world. This all new converted energy-efficient electric locomotive has been flagged off by PM Modi in Varanasi. As per the Indian Railways, the entire project is an Indian R&D innovation for the entire world. * Union Culture Minister Mahesh Sharma inaugurated India’s very first ‘Fulldome 3D Digital Theatre’ at the Science City in Kolkata, West Bengal. * Inland Waterways Authority of India (IWAI) launched a new portal Least Available Depth Information System (LADIS) for real-time data on available depth on stretches of National Waterways. * A Himalayan Cloud Observatory is set up in Tehri district of Uttarakhand with a motive to forecast and monitor cloudburst incidents in the Himalayan region and help to minimize the damage. * Union Minister of Textiles Smriti Irani launched the India Size project in Mumbai. A first-of-its-kind project in the history of the country, India Size aims to arrive at a standard Indian Size for the ready-to-wear clothing industry, on the lines of the standardized sizes available in countries such as the USA and the UK. * Pradhan Mantri Jan Arogya Yojana (PM-JAY) App launched on Google play store. Ayushman Bharat Yojana or Pradhan Mantri Jan Arogya Yojana (PM-JAY) is a centrally sponsored scheme; which was launched in the year 2018, under the Ayushman Bharat Mission of MoHFW in the country. * Ministry of Coal of India entered into an MoU with the Ministry of Energy, Republic of Poland. The objective is to foster relations in the field of coal mining and clean coal technologies. * Minister of Railways, Piyush Goyal launched the “The Future of Rail” report of the International Energy Agency (IEA). The Future of Rail is the first-of-a-kind report that analyses the current and future importance of rail around the world through the perspective of its energy and environmental implications.